Pipestone County is a county in the U.S. state of Minnesota. As of the 2010 United States Census, the population was 9,596. Its county seat is Pipestone. The county was created (as Rock County) by the Minnesota Territory legislature on 23 May 1857. An act of the Minnesota state legislature on 20 February 1862 changed the county name to Pipestone, due to the pipestone quarry located in this county. County organization was effected by a state act dated 27 January 1879, with Pipestone City (which had been platted in 1876) as the county seat (the name of the county seat was later shortened to Pipestone). The pipestones are from deposits of red pipestone used by Native Americans to make pipes. Pipestone National Monument is located in the county, just north of the town of Pipestone. 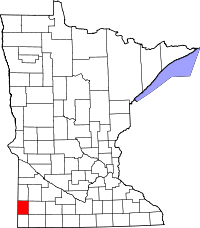 Pipestone County lies on the west line of Minnesota. Its west border abuts the east border of the state of South Dakota. The Rock River rises in the county and flows southward into Rock County, being augmented by the East Branch of the Rock River near the south border. The terrain consists of low rolling hills, carved by drainages. The area is devoted to agriculture. The terrain slopes to the west and south, with its highest point on the upper part of its east border, at 1,883' (574m) ASL. The county has a total area of 466 square miles (1,210 km2), of which 465 square miles (1,200 km2) is land and 0.9 square miles (2.3 km2) (0.2%) is water. As of the 2000 United States Census, there were 9,895 people, 4,069 households, and 2,726 families in the county. The population density was 21.3/sqmi (8.22/km²). There were 4,434 housing units at an average density of 9.54/sqmi (3.68/km²). The racial makeup of the county was 96.68% White, 0.17% Black or African American, 1.48% Native American, 0.46% Asian, 0.02% Pacific Islander, 0.26% from other races, and 0.93% from two or more races. 0.70% of the population were Hispanic or Latino of any race. 35.7% were of German, 24.8% Dutch and 14.3% Norwegian ancestry. There were 4,069 households out of which 31.00% had children under the age of 18 living with them, 57.60% were married couples living together, 6.50% had a female householder with no husband present, and 33.00% were non-families. 30.10% of all households were made up of individuals and 17.20% had someone living alone who was 65 years of age or older. The average household size was 2.38 and the average family size was 2.96. The county population contained 25.80% under the age of 18, 6.80% from 18 to 24, 24.60% from 25 to 44, 21.40% from 45 to 64, and 21.30% who were 65 years of age or older. The median age was 40 years. For every 100 females there were 92.80 males. For every 100 females age 18 and over, there were 89.40 males. The median income for a household in the county was $31,909, and the median income for a family was $40,133. Males had a median income of $27,642 versus $20,759 for females. The per capita income for the county was $16,450. About 7.80% of families and 9.50% of the population were below the poverty line, including 11.20% of those under age 18 and 11.10% of those age 65 or over. In recent decades the voters of Pipestone County have trended Republican. In no national election since 1976 has the county selected the Democratic Party candidate (as of 2016). ^ a b "State & County QuickFacts". United States Census Bureau. Archived from the original on July 16, 2011. Retrieved September 1, 2013. ^ "Population and Housing Unit Estimates". Retrieved 13 April 2019. ^ "US Decennial Census". US Census Bureau. Archived from the original on May 12, 2015. Retrieved October 24, 2014. This page was last edited on 13 April 2019, at 22:41 (UTC).